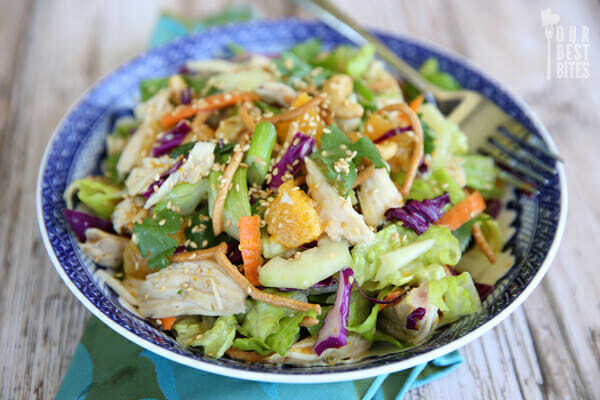 I’m starting a contest to see how many Asian salads I can accumulate on Our Best Bites. And I’m crushing it. I actually started cooking the day I made this, with the intention of replicating a really yummy orange poppyseed dressing I had had, but when I opened my cupboard and saw the sesame oil sitting next to the rice vinegar, I was swayed. I’m a sucker for Asian salads (which should be quite obvious by now.) The thing is, I have different types for different occasions. There’s the naughty Asian salad, with deep fried wontons, that I make for things like baby showers, and then there’s the super light detox salad, with hardly any oil in it, that I love eating for a week after road trips. And then there’s the amazing Thai-inspired, uber protein packed salad for 1 that so many of you have fallen in love with. I made this salad to remind me of a good restaurant salad. The kind with an amazing dressing that’s piled high with all sorts of goodness. 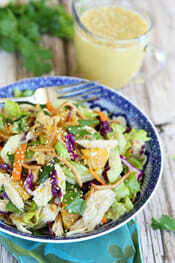 This dressing is killer, and you can be creative with your salad fixings to make it just the way you like it. This is a great party salad, or dinner salad for a hot summer night when you don’t want to turn on the oven. 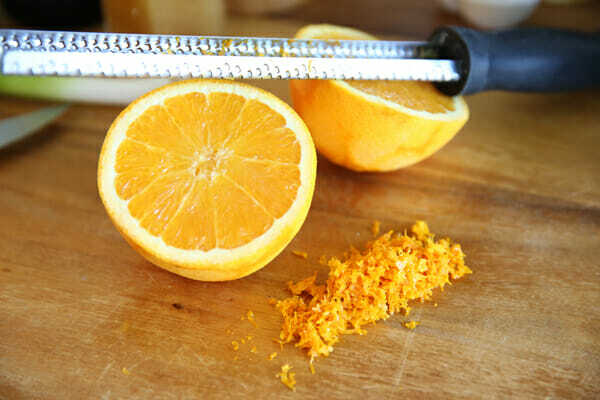 To start, zest an orange and set the zest aside. If you don’t have a Microplane zester, seriously. Just order one! 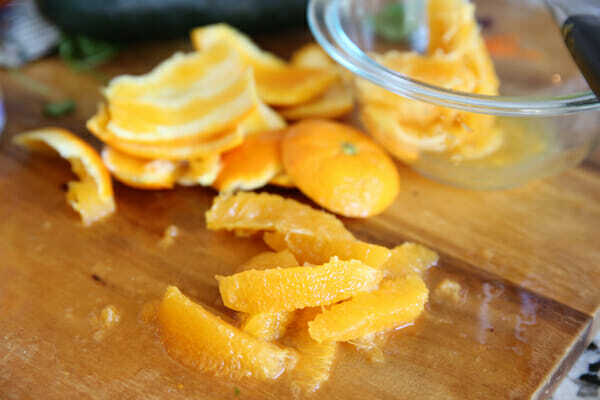 Then pour that freshly squeezed juice into a blender, and add a little rice vinegar. 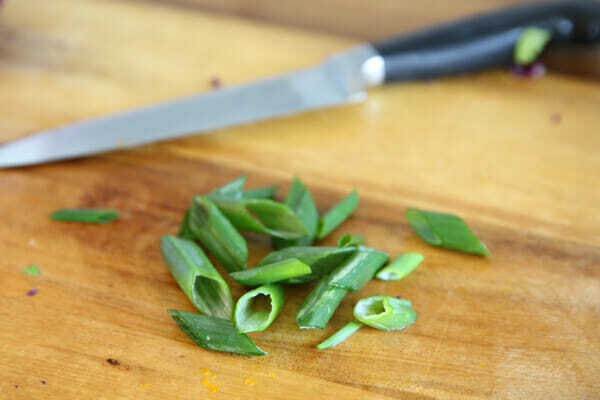 and add some flavor with garlic, and green onions. 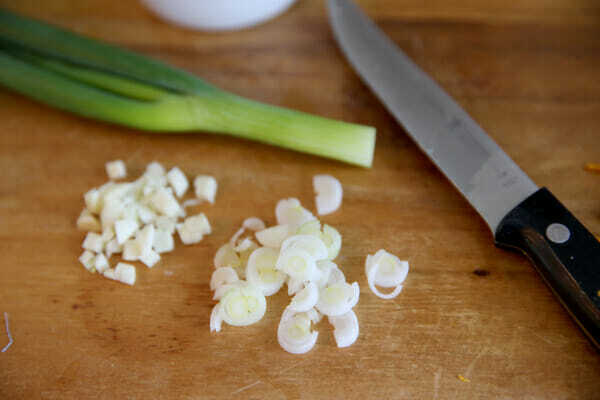 For the dressing, we’re just using the firm white ends of the onion. Save the rest for the salad because you’ll need it then. 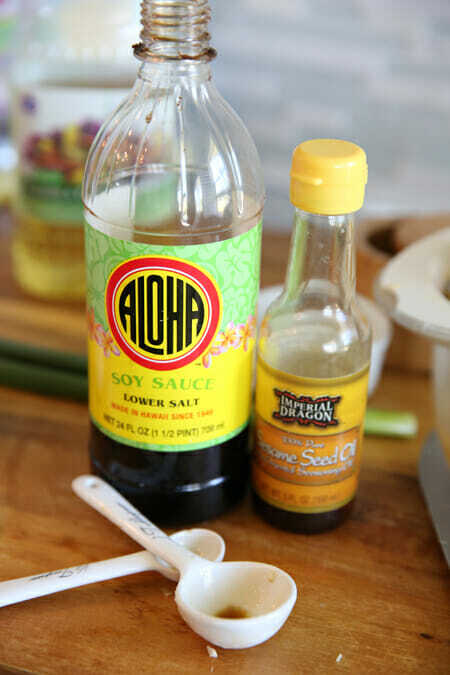 A splash of soy sauce and sesame oil give it that distinctive Asian flair. 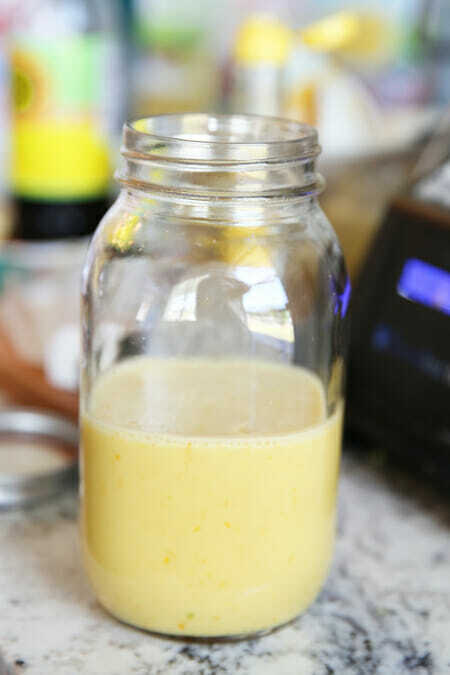 After zipping it all up in a blender with the oil, add in that orange zest and pulse a couple of times to distribute it throughout the dressing. I love how those little flecks of orange show throughout. 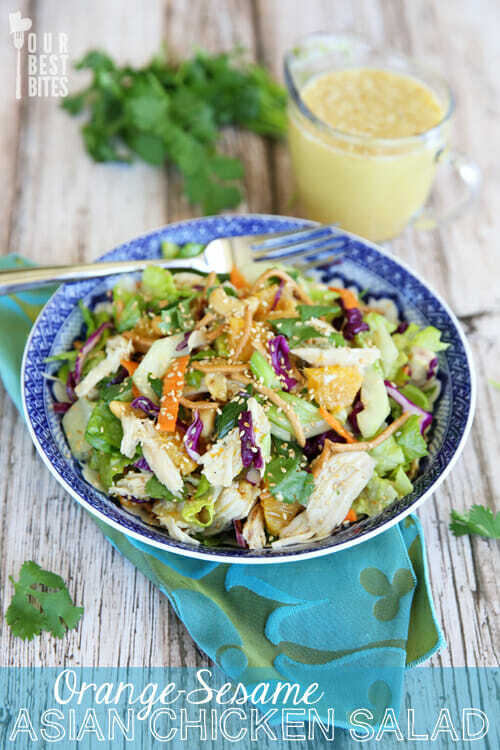 Place your dressing in a jar and toss in some toasted sesame seeds. If your sesame seeds are un-toasted, just pop them in a dry pan on the stove top and shake them around over medium heat until they’re golden brown. Cool them off before putting them into the dressing. For the actual salad, you can really use whatever you like. This makes about 2 cups of dressing, so it’s plenty for a big ol’ salad. 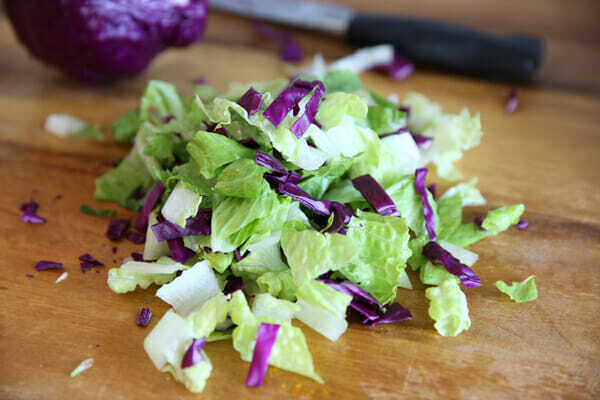 I like super crunchy romaine with a little sliced purple cabbage in there as well. 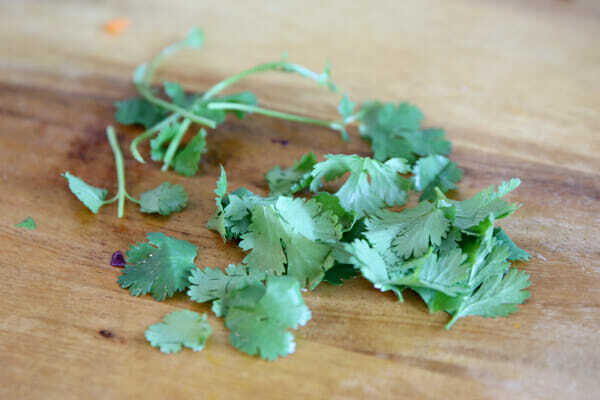 For most recipes, I’m constantly telling you guys to not take the time to pick cilantro leaves off the stems, just chop it all up, but here’s an exception. In this case, the leaves are used as one of the salad greens, so pull those little guys off the stems and into a big fluffy pile. 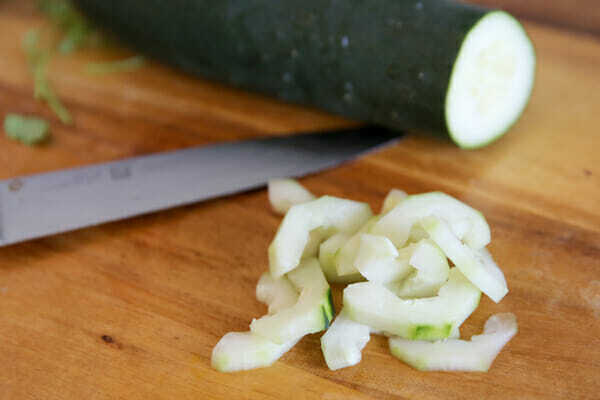 and also some sliced cucumber. 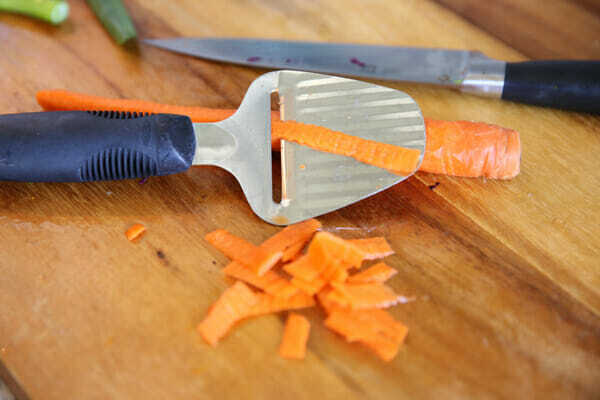 When it comes to carrots, sliced carrots are way to thick and crunchy, but shredded or shaved carrots seem to thin and weak. I’ve found a perfect happy medium with a cheese slicer. It’s a little thicker than a vegetable peeler, but thinner than my knife skills, so it works beautifully. I just take long slices, and chop them into shorter pieces. I also throw in cooked, shredded chicken. Lastly, the one thing every good Asian salad needs is some crunch. Fried won-ton strips are always a hit, but if you want something easier, a can of crunchy Asian noodles are great. 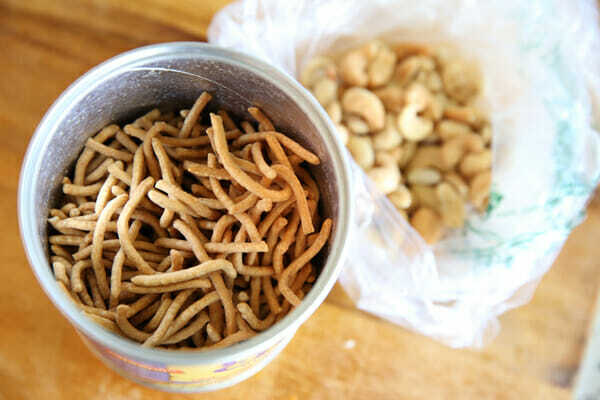 I combine that with some cashews for both crunch and flavor. Toss it all together and you’ve got a restaurant quality salad right on your own dinner table. This is so fresh and bright, and makes a great salad for upcoming summer get-togethers, or just a great weeknight dinner when you don’t want to heat up the oven! Grab a rotisserie chicken and you’re set. Switch up as you like, and measure according to taste! This recipe makes about 2 cups dressing, which is plenty for a very large party salad. Prepare dressing. Wash and zest orange, and set zest aside. 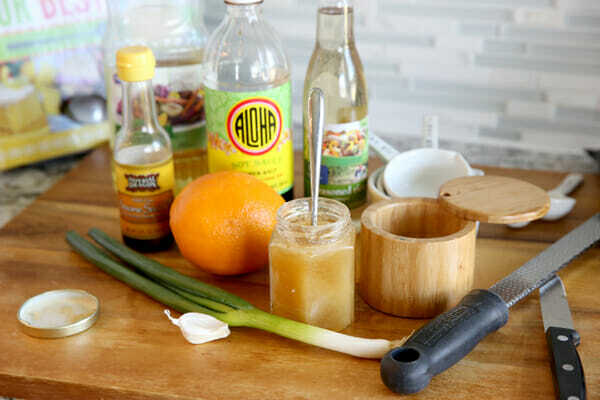 Place orange juice, vinegar, honey, onions, garlic, sesame oil, and soy sauce in blender and blend until smooth. 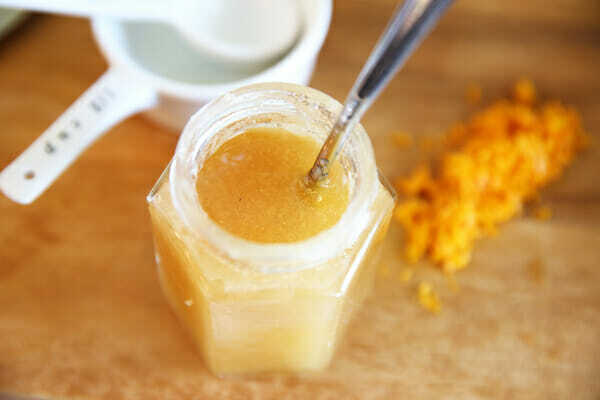 If necessary, use a spatula to make sure honey is not stuck in bottom of blender. 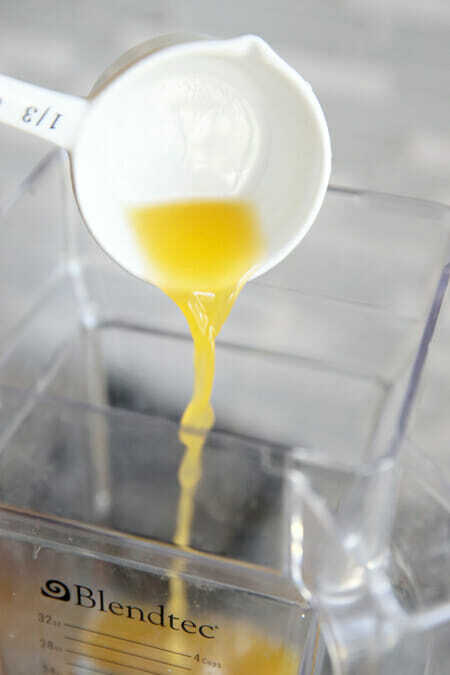 With blender running on low, slowly drizzle in oil in a small, steady stream, to emulsify. Add orange zest and pulse to combine. 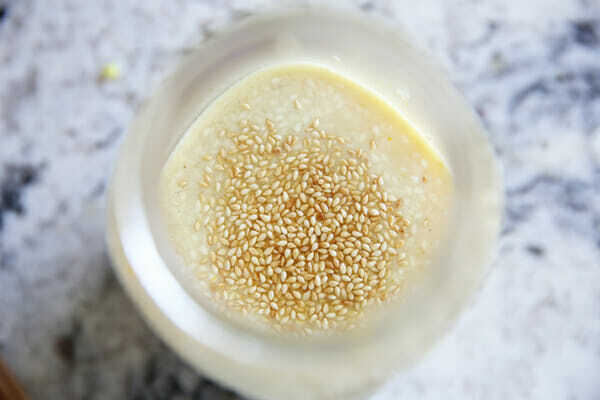 Place dressing in a lidded jar and add sesame seeds, shaking to combine. Refrigerate until ready to use. Mix salad greens and vegetables. Right before serving, add orange slices, nuts, and noodles. Toss with dressing and serve. Great deal available in The Shop. Our most popular Garlic (now in an extra large bottle!) paired with our extra large Extra Virgin. Make sure you select the large bottle of Garlic from the drop down menu! Oh yum! This sounds super delicious!!! Can’t wait to try this salad. Yum!!! This sounds delicious! I’m trying hard to lose weight (down 10 pounds so far — yea!) so we are doing a lot of dinner salads and this would add some nice variety. And it has lot of ingredients my kids like so a new salad that we don’t have to coerce them to eat would be a bonus, too. Thanks! Not an Asian salad person, but I think I have been persuaded to try this one! I love your caribbean salad. Would you say this is similar? Which do you think is better? I am making your fruit gallete tonight (from 2009..i’m going OBB Old School) and only have frozen mixed berries. Can I use frozen and if so what adjustment do I make? I don’t want a soggy gallete! p.s. I’m making this salad tomorrow night–can’t wait! Yep totally, I use frozen all the time. You don’t need to make any adjustments, aside from maybe baking just a tad bit longer. Enjoy! **Kroger has an amazing orange poppy seed dressing…so yummy! Yes, that’s the one I was going to replicate, lol! Mmmm….I love Asian salads too. This is going on our menu! I want to eat this. Right. Now. Looks great–I am making this tonight. 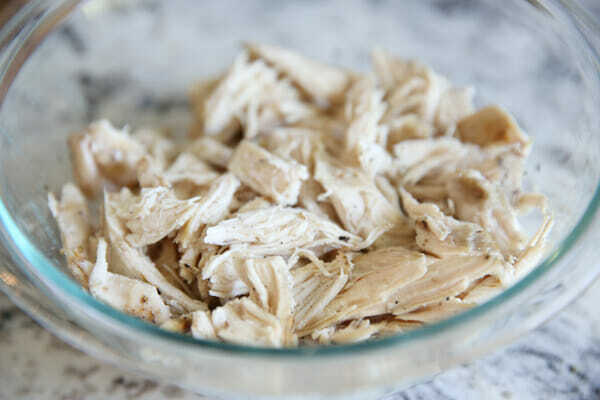 Just FYI, shredded chicken is not listed on the salad ingredient list (that I could find). Thanks for the recipe! I made this several weeks ago and loved it, but I’m the only one in the family eating salads right now. Do you know if it would work on an individual portion basis, like the healthy Thai salad? If you haven’t yet made this salad “naughty'” and added the fried wontons, you should! It’s amazing.